Dies R Us: A Day Just for You! Hi everyone, Deanna here, back with another fun inspirational project for you all. Here is what I made. I started with a cream colored card base cut and folded to make a 4 1/4" X 5 1/2" card base. I then added a black mat cut at 4" X 5 1/4" and my patterned paper mat cut at 3 3/4" X 5". Next, using the Yvonne Creations Toadstool Die I cut my toadstools and grass out of some striped paper. I adhere the toadstools straight to my card front and popped up the grass using foam tape. I added some enamel dots to the holes cut in the toadstool tops and stamped my sentiment using Memento Tuxedo Black ink. That's my card for today, I hope you enjoyed it. Great, fun card, using pretty papers. Your card is as cute as can be! Those toadstools are darling!! Love how you decorated the toadstools! I can honestly say I never thought about purchasing a 'toadstool' die but after seeing this fun creation, it's now on my ever growing list! Great job! Such a darling toadstool grouping with the printed papers and fun enamels! Wonderful card design, Deanna! 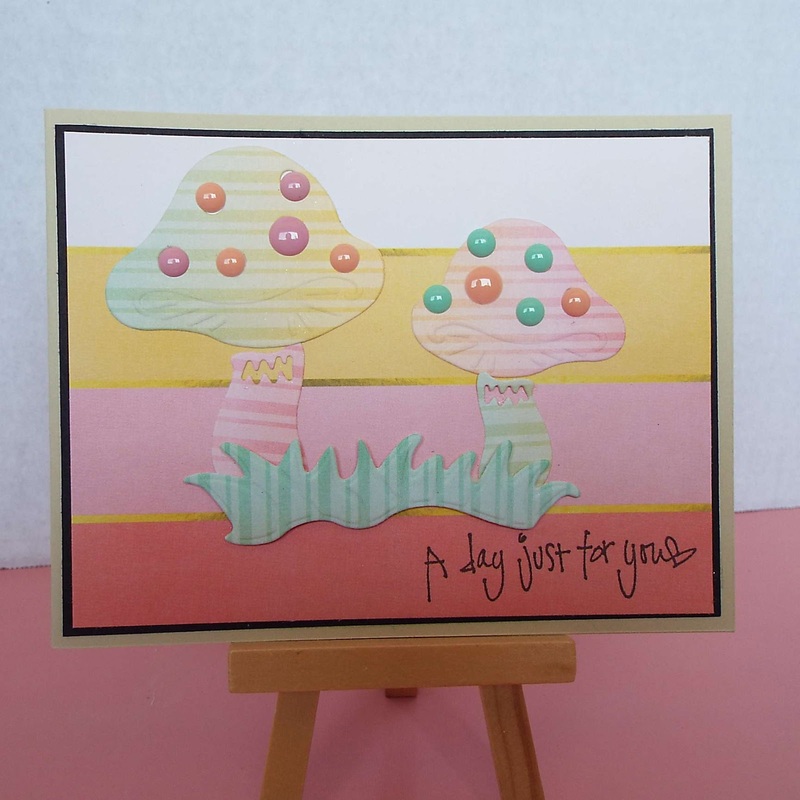 I love toadstools and your card is so pretty with the colors you used. Nice use of the enamel dots too.